Australian Music Books | 2000 Weeks + The Real Thing ? 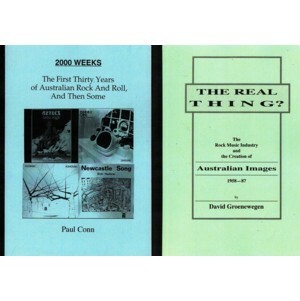 Shop / Australian and New Zealand Music Books / Other Australian Music Books (new) / 2000 Weeks + The Real Thing ? Two books analysing Australian popular music, published as slim A4-sized books) by Moonlight Publications and sold together at a reduced price. 2000 Weeks – written by Paul Conn and published in 1996. Subtitled “the first 30 years of Australian rock’n’roll and then some”, this explains how the Australian music scene responded to the changes and new directions created by overseas artists. Important releases by local artists are pinpointed, and their significance is analysed. The Real Thing ? – written by David Groenewegen and published in 1997. Subtitled “the rock music industry and the creation of Australian images 1958-1997”, this analyses the Australian rock music industry and the creation of distinctively Australian images. It also considers how musicians and the industry have sought to promote themselves to the local audience.